Many designers wonder how to 3D print models and products? In a previous article, we explored a List of Free Software for 3D Printing and Browser-based Modeling Software for 3D Printing. 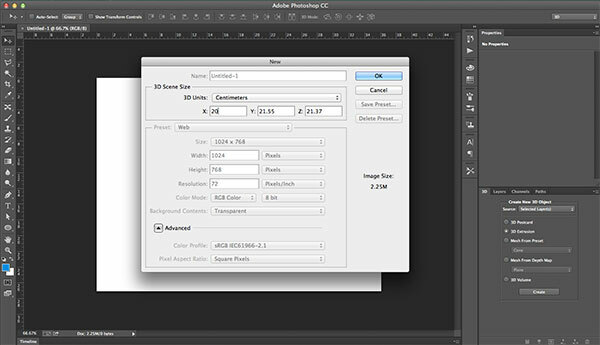 The recent updates in Adobe Photoshop CC allows designers to directly 3D print their designer using the new 3D printing feature. 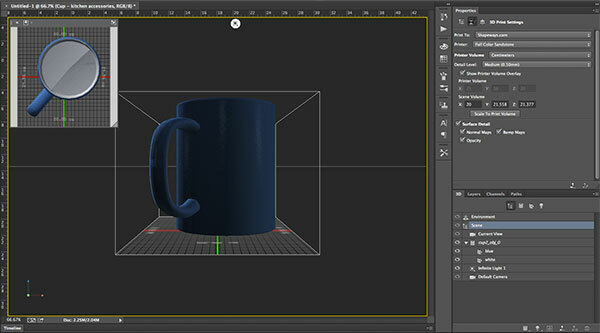 3D models can be directly created in Photoshop or imported into it from external 3D modeling applications. Then, you can setup the 3D model printing properties and choose either to print it directly through the connected 3D printer. If there is no 3D printer attached to your computer, you can still 3D print the artwork by choosing Shapeways.com, an online 3D printing service that allows designers to print their models and sell it in the marketplace area (5 Places to Sell Your 3D Printing Models). After setting up the 3D model, you can simply export it as .STL format to upload to Shapeways.com or send it to a local 3D printer (5 Affordable 3D Printers to Buy). 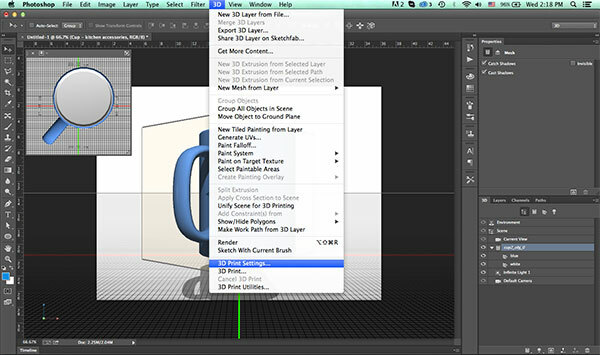 Today, we will explore the 3D printing process in Adobe Photoshop CC and how to export the 3D model in STL format. 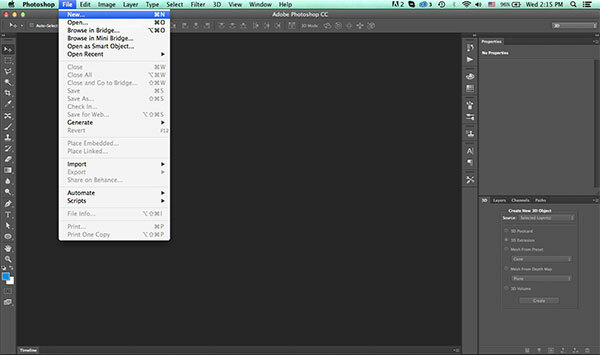 First, you need to create a new Photoshop document with any size from File > New Document. Then, import an existing 3D model by choosing 3D> New 3D Layer from Document. 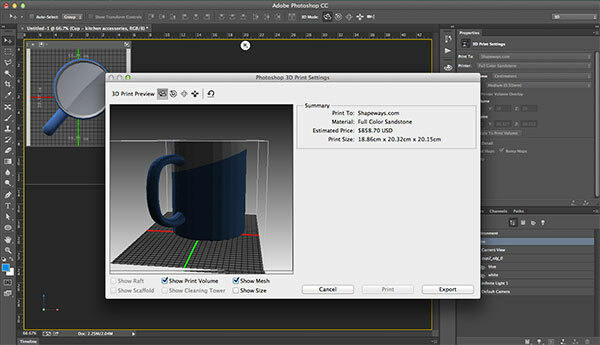 Navigate for the 3D model file, a dialog box appears to lets you setup the desired size for the imported 3D model. Once the 3D model is imported to the Document. Choose 3D> 3D Printing Settings. This command will open the setting tab where you can setup the 3D printing process. You can choose either to print your model using Shapeways.com online service or using your local printer if you have one. In this example, let us choose Shapeways.com and set the material type from the Printer field. Also, you can set the size of the printed object or simply click on Scale To Print Volume. The Surface details lets you choose the map types that will be reflected in the model surface such as the Normal maps and Bump maps. Also, you can choose to create supportive structures if your 3D model has weak or external parts. Click on the Start Print icon on the bottom of the Properties panel to start repairing the model and open the 3D printing dialog box that provides summery about the model, its size, estimated printing price, and 3D preview. Click Ok to start exporting the 3D as STL compressed file. Then, you need to go to Shapeways.com and create your own account and upload to it the STL compressed file and setup the 3D product name, description, and available printing materials. In a similar way, you can upload the STL file to other online services.